Well, I recently decided to try something completely out of the box from anything else I've done: I want to join a band. So as of now, I am the new DJ for a rock band in Atlanta by way of Detroit + Los Angeles. The band is called Detroit Mutant Radio. We basically answer the question, "What would Red Hot Chili Peppers sound like if they did hiphop?". So yeah. Wrap your head around that. Better still, hook up with the band on your favorite media outlet at iLike, GarageBand, YouTube, FaceBook, MySpace, CDBaby, Amazon.com, and any of the hundreds of Google search entries we have. I met up with the band a few weeks ago thanks to an ad on Atlanta CraigsList. I played my first live show with them August 30th @ the Apache Cafe in downtown ATL. OMG that was so fun. We ended up being the house band for poets from DefPoetrySlam and rocked out 2 sets in between. I even managed to slip in a quick solo hip hop mix with a bit of Jurassic5, KRS-One, Beastie Boys, and De La Soul. I even got pics of the band! Check it out! As an unexpected turn to my evening yesterday, I had Dirty Mike fork over some tickets to see Gnarls Barkley at The Tabernacle here for their final US homecoming tour date in Atlanta. 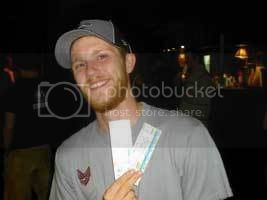 Dirty Mike showing us tickets to a concert he will never see. 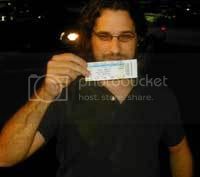 My partner in crime, Drifter (the Val Kilmer look-alike shown proudly posing with the free tickets we scored) and I arrived to the venue as the opening act was finishing their set. As to be expected, it was a packed house, standing room only. The crowd was a very cool and broad hodge-podge of different ages and demographics. As soon as the enormous Gnarls Barkley banner dropped from the ceiling to provide the backdrop for the band, the whole place cheered wildly. Good gobeldy goo! What a week! Seems the networking I've been doing lately has paid off. So, kick back. Relax. Grab a sandwich because I'm going to tell y'all the whole detailed story. This is yet another day in the life of B-Naut.